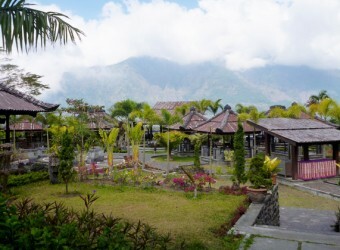 One of the popular sightseeing spots in Kintamani Height, Toyabungkah Village is also known as a hotspring village which has restaurants with a beautiful Mt. Batur and tourist resorts. They use natural hot water which is warmed up by geothermal energy of volcano. I still had much time after went sightseeing Kintamani then guide took me this place. A village where I can feel Bali, full of fresh green trees. There is a hot spring in the village. I’d like to soak in the hot spring next time!